Balmoral Straight Comport BowlCurved Clear Glass Frame 5" x 3"
This is a personalised 5mm Curved Clear Frame with 4" x 6" Gilt Photo Frame - with a chrome photo frame, not gold coloured as on the photo. The price includes up to 50 characters engraved for free on the curved clear gilt photo frame. Any additional characters to personalise the glass photo frame are then charged at 25p each, and there is an additional cost for a logo. 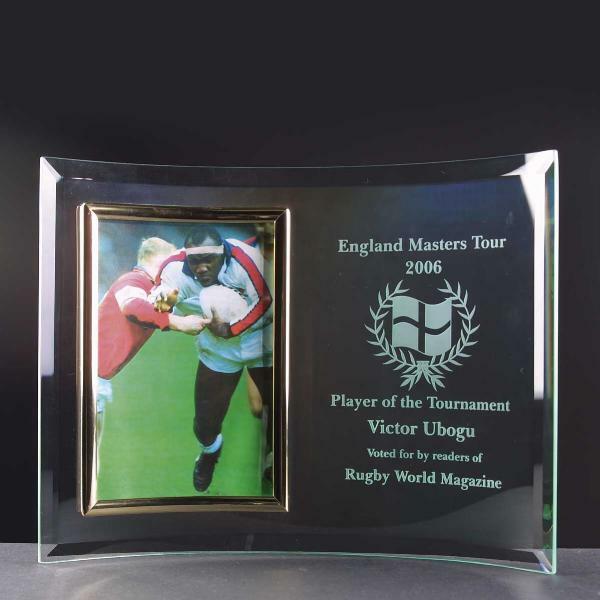 The engraved glass photo frame is supplied in a white box. The total width of the portrait curved gilt photo frame is approximately 28cm wide, 6.5cm deep and 20cm high. The personalised glass photo frame is postage band B.